- Arctic Sense Grip Concept: Enables first-class winter grip as well as more precise and comfortable handling. The computer-optimized sipes, or grooves and cuts, of the symmetrical tread pattern work optimally in varying weather on ice, snow and bare road alike. - Cryo Crystal 3: Small bio-material particles in the new-generation rubber compound that boost lateral and longitudinal grip, acting like built-in studs, creating sharp, tough grip edges inside the rubber. - Efficient Fuel Savings: With a lightly rolling tread design and state-of-the-art tread compound, it has up to 5% lower rolling resistance than the award winning Nokina Hakkapeliitta R2, and even below values of some all-season tires. - Aramid Sidewall: Durability and protection for surprising situations. The sidewall compound that is exceptionally durable and puncture-resistant. - Ultra High Tensile Steel: Belt material makes the structure light but hard, providing precise handling even at higher speeds. - Driving Safety Indicator and Winter Safety Indicator (DSI, WSI): As the tire wears, the DSI fades, allowing you to quickly and accurately check tread depth. 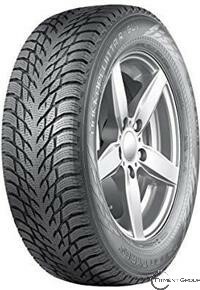 WSI: Once the snowflake has worn out, the driver should purchase new tires to ensure winter driving safety.